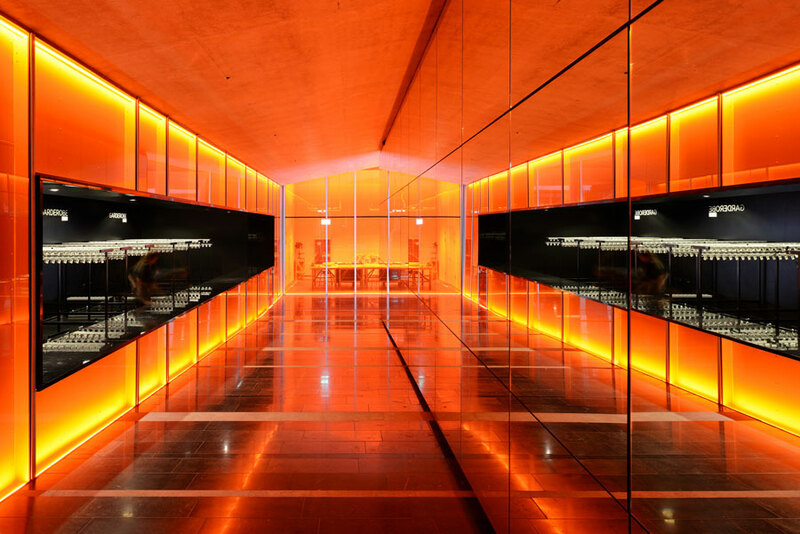 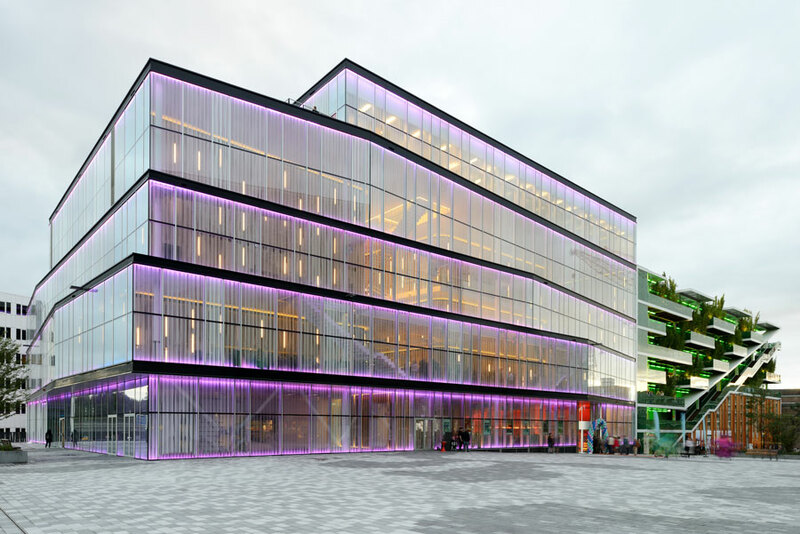 Frits van Dongen and Patrick Koschuch, who are both formerly architects of ‘de Architekten Cie’, latest project is the Kunstcluster (Art Cluster), situated in the Dutch city of Nieuwegein. 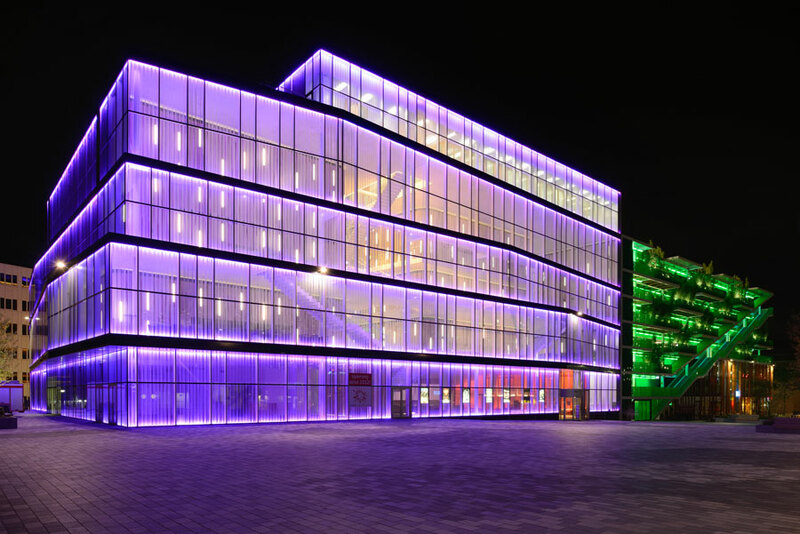 The building is destined to become a landmark within the town centre which is in the process of being regenerated over the next few years. 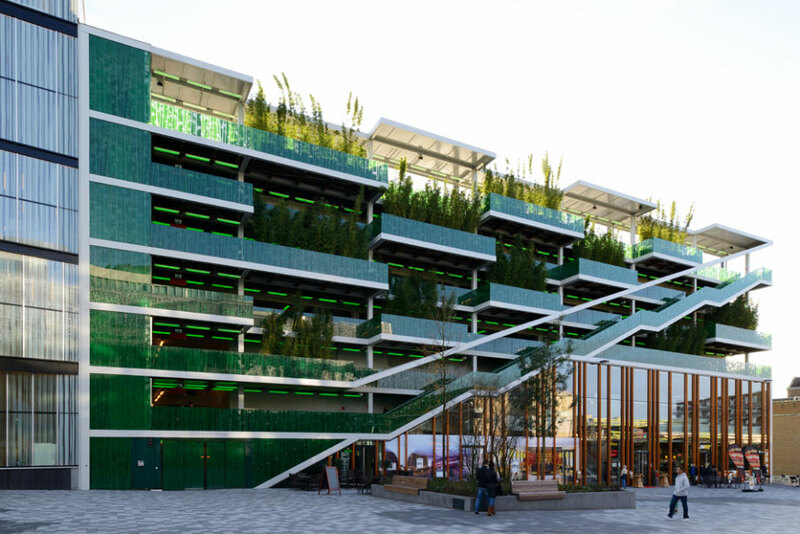 A new town hall is to be built, with shops, homes and offices above street level and an underground car park below. 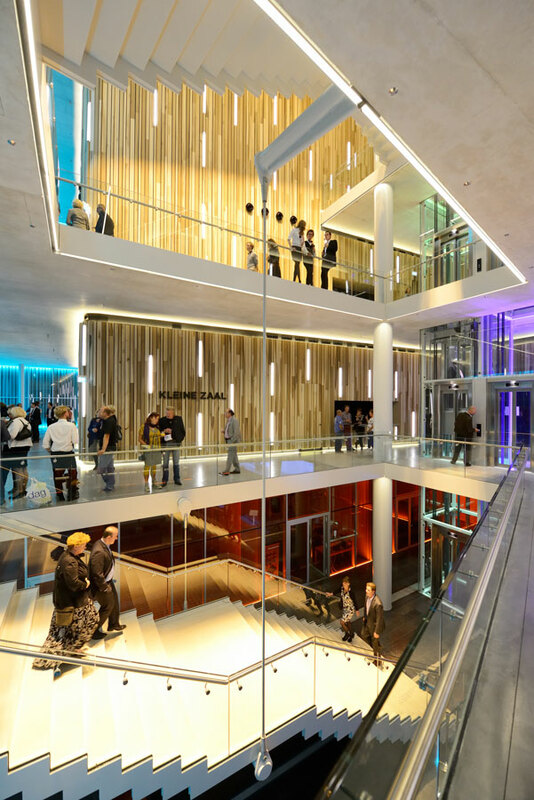 The Kunstcluster is made up of two blocks; the theatre and arts centre and a multi-storey car park, which includes a retail outlet on the ground floor. 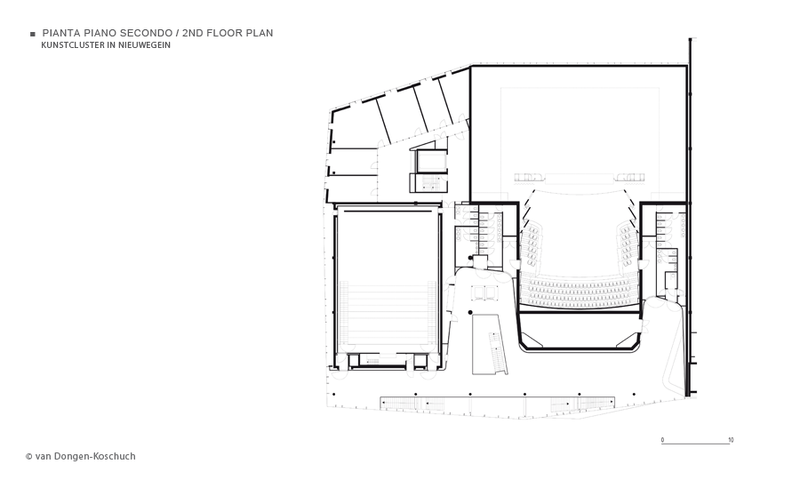 The new theatre includes an auditorium and a studio theatre. 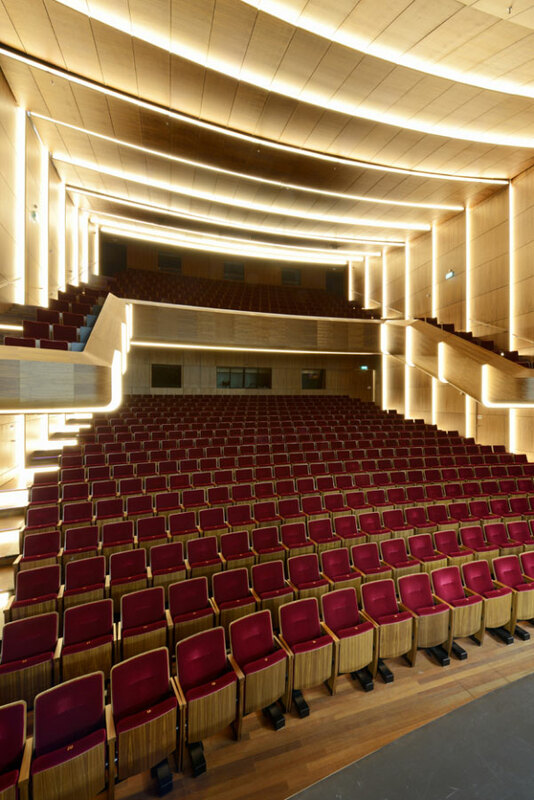 The main auditorium can seat up to 700 people, with a podium and ample stage space for all types of production. 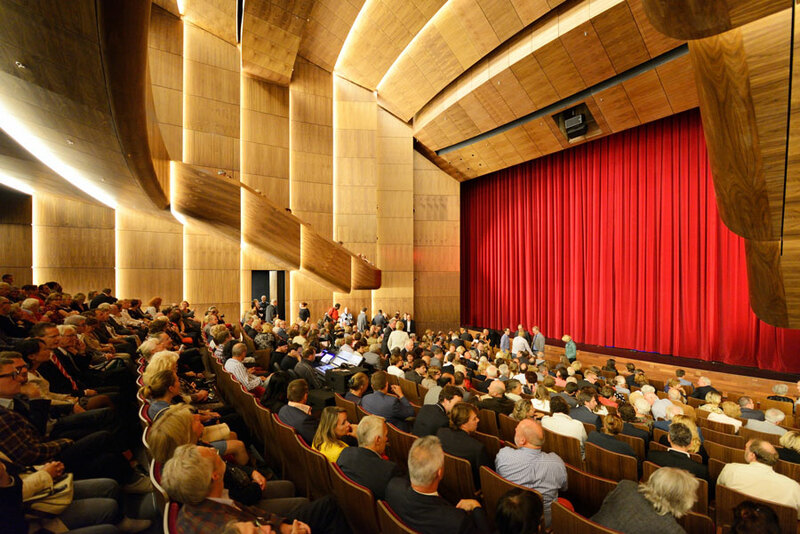 The studio theatre is considerably smaller with the capacity to seat 200 people but has a foldaway stage so it can be used for various events, including pop and rock music concerts. 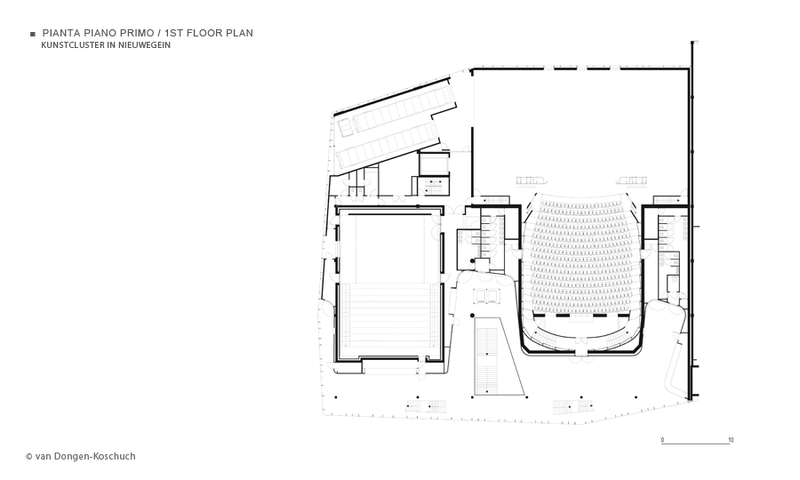 The future arts centre will be located above the theatre, a multifunctional venue for music, dance and acting classes. 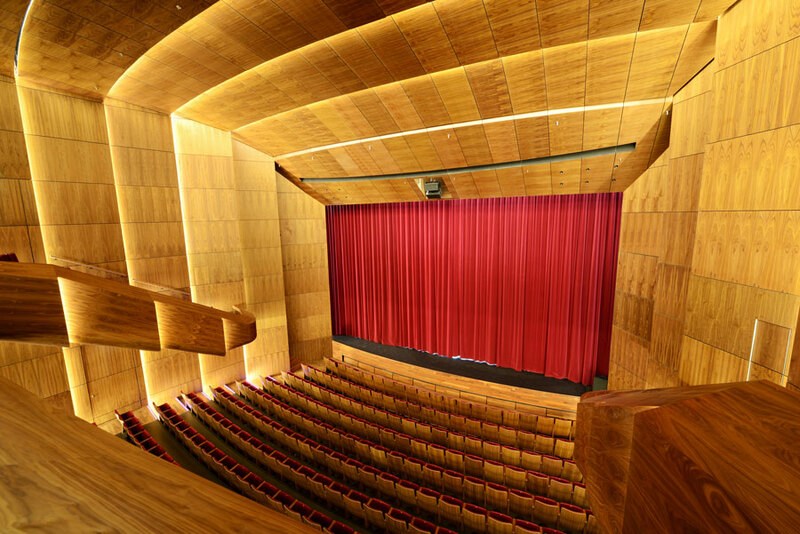 The ceiling and balcony in the main auditorium are entirely clad in acoustic MDF panelling with a natural veneer facing in American walnut. 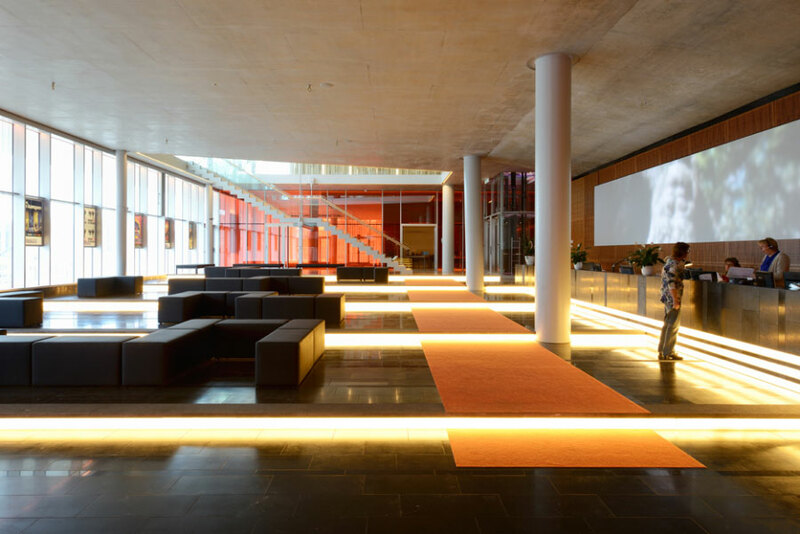 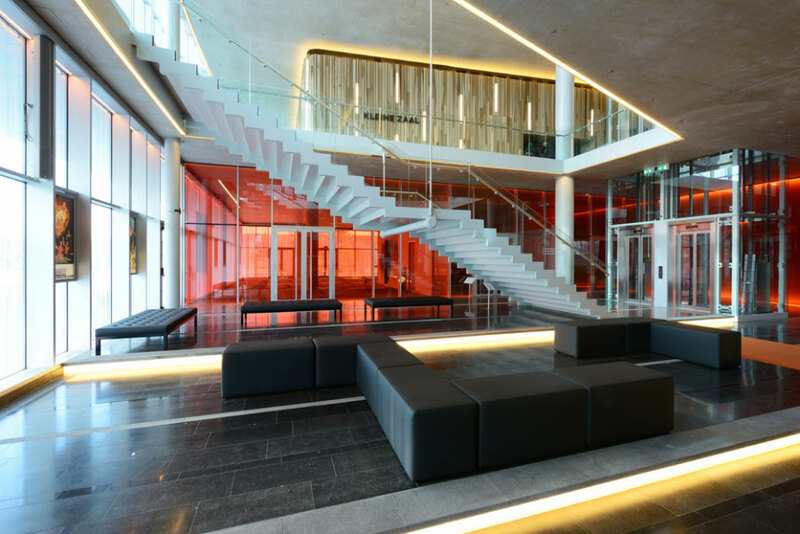 Completing the complex are three spectacular foyers and a theatre café which looks on to the town’s central square, the Stadsplein. 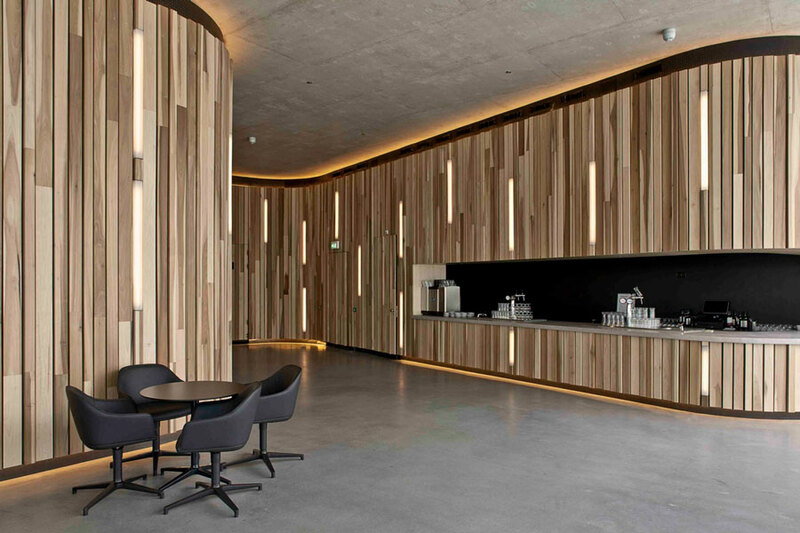 Frits van Dongen and Patrick Koschuch specified American tulipwood cladding for the curved walls in the foyer because they were attracted to tulipwood’s varied natural tones with cream white and pale olive green in the sapwood contrasting with dark purple, brown and olive streaks in the heartwood. 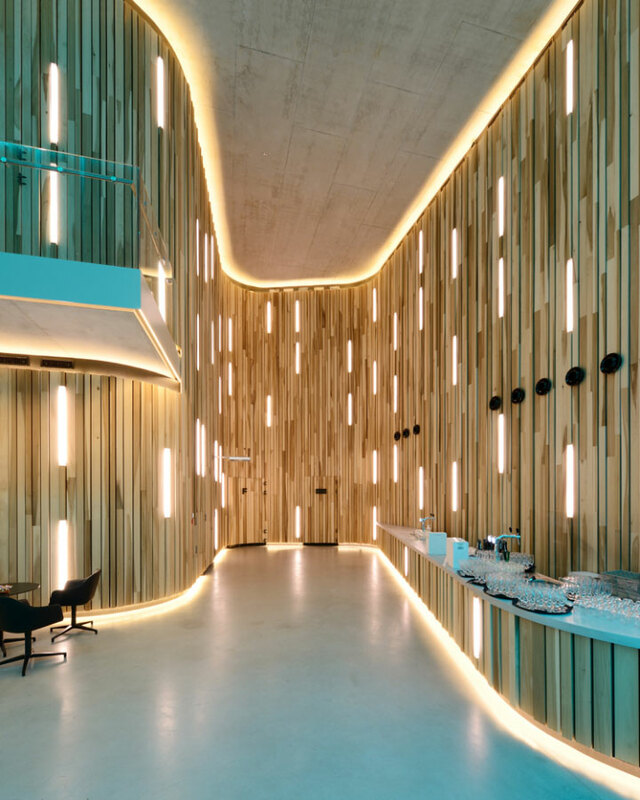 “This wood specie was the perfect choice to symbolise the variety of spaces within the building and the interaction between the foyer, the hall and the audience,” commented Koschuch. 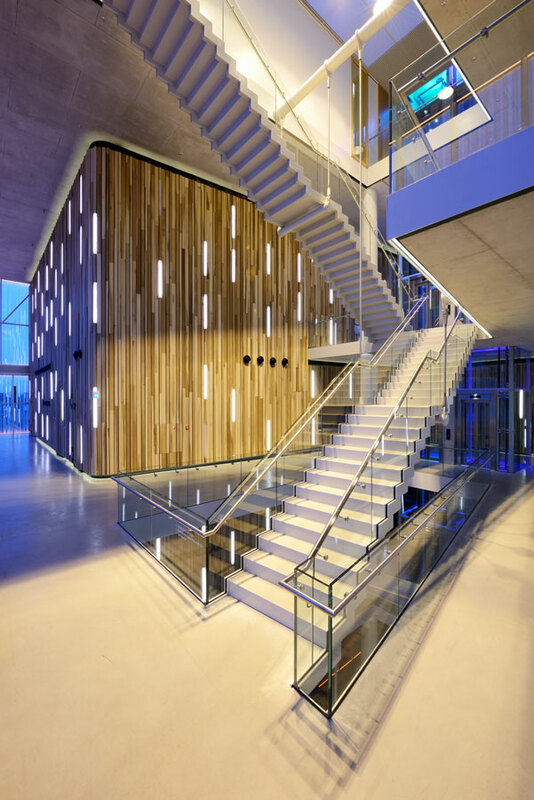 To meet the architect’s specifications Derako International, the cladding system suppliers, engineered the solid tulipwood slats in three different dimensions (45x70 mm, 30x98 mm and 15x126 mm), which were then randomly fixed on their metal carrier system. 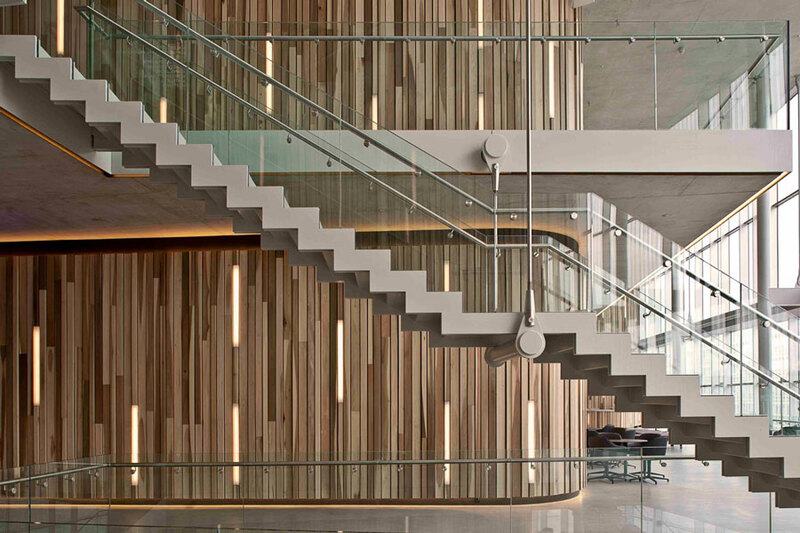 The variety of tones is enhanced by the deliberate random assembly of the slats. 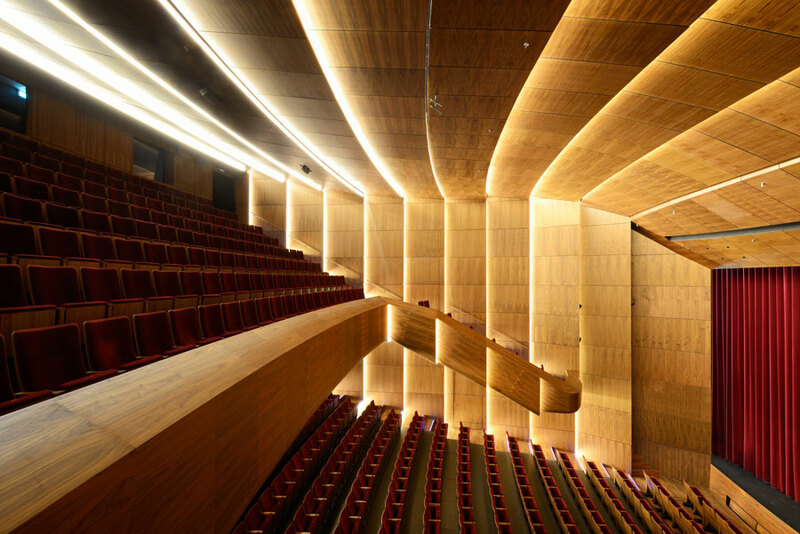 The tulipwood slats are also fixed on slightly different levels to increase sound absorption. 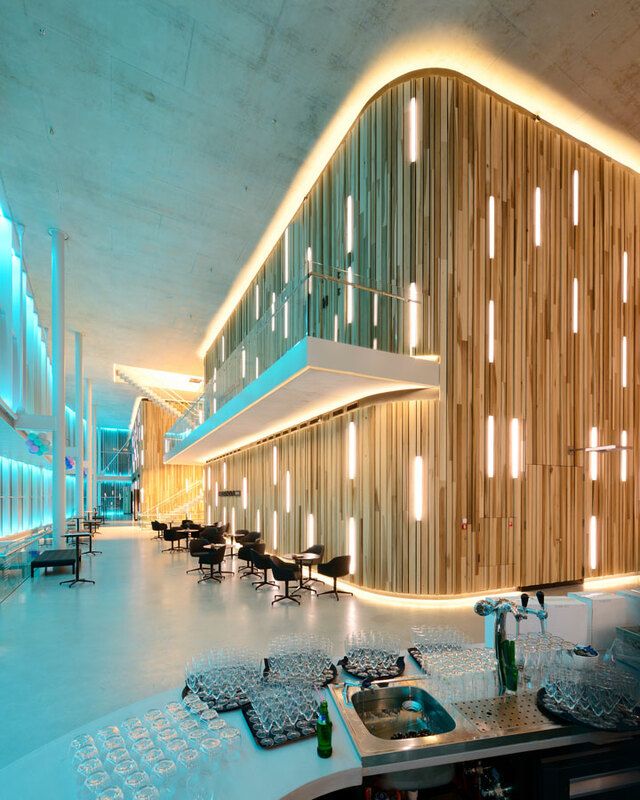 Sita Veer from Derako International explains, ‘The tulipwood cladding wraps around several curved walls and therefore our production plant had to shape the metal carriers to 7 different types of radii using precision tools. 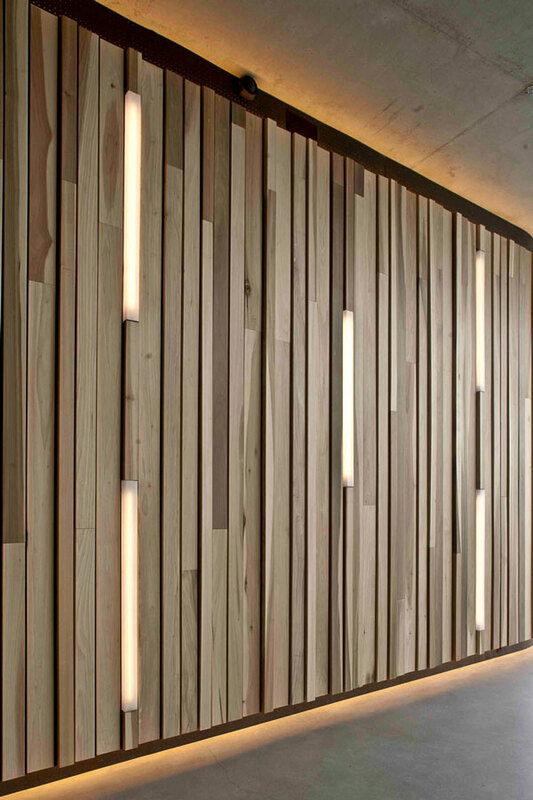 We also had to take into consideration the wall lights which are embedded in the wooden wall cladding. 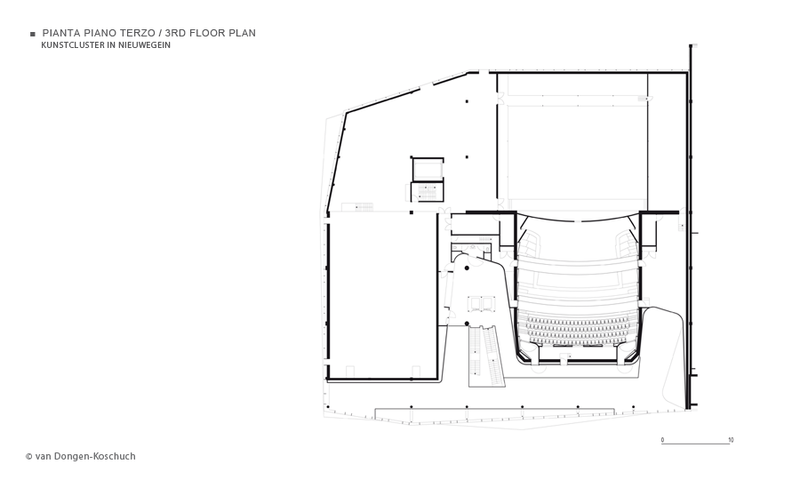 We based the plans on the building’s CAD drawing to design our carrier system’. 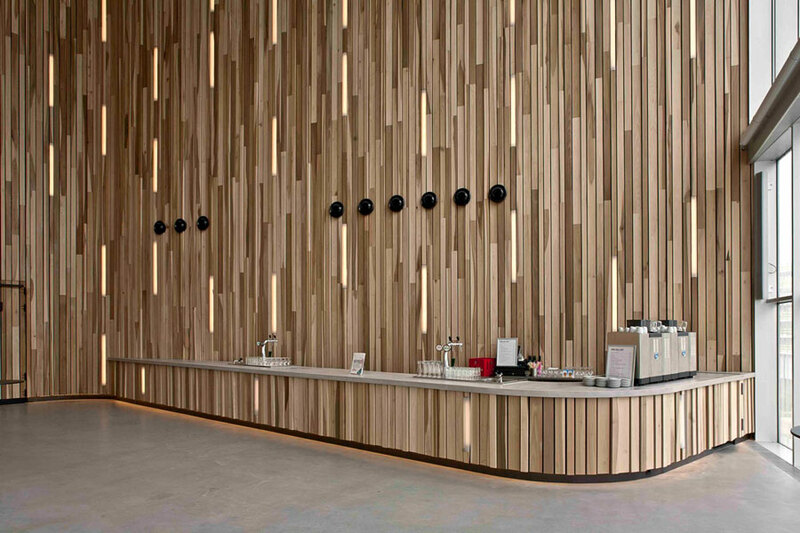 The finished wall cladding successfully highlights the natural colour variations in tulipwood and this is enhanced by the random placement of the cladding slats. 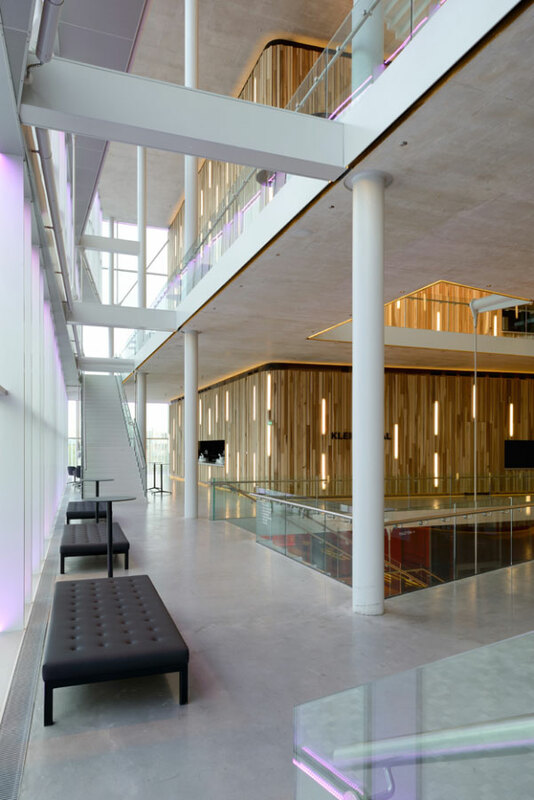 The external glazing of the foyer area is coated with a print finish on the inside, creating an illusion of stage curtains. 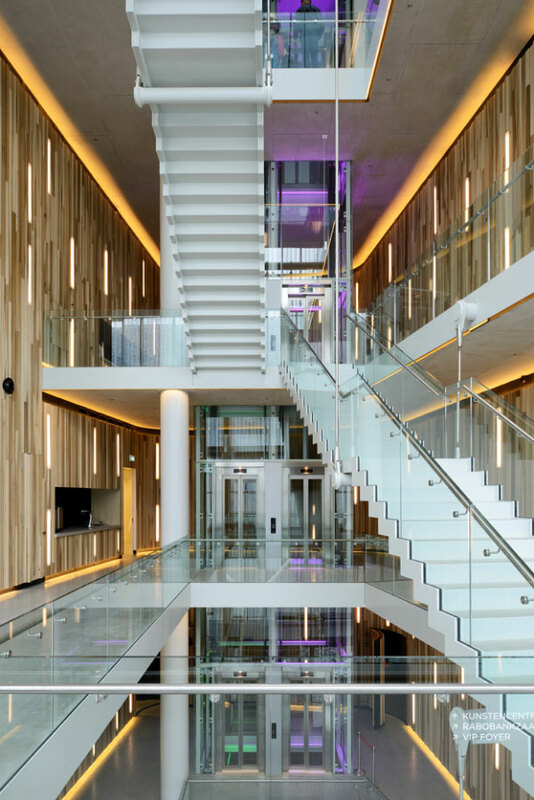 This is also functional and reduces the level of light penetration from the south and east facing façades, preventing overheating in the grand staircase and foyer area on warm days. 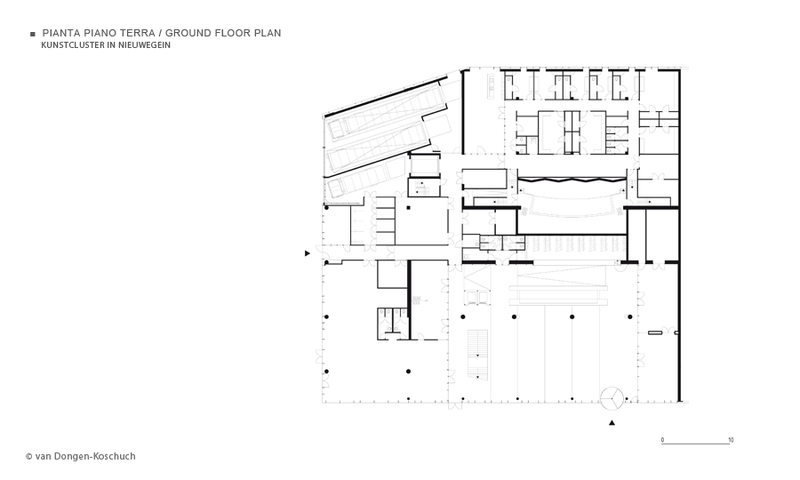 The level of pigmentation of the print is sufficiently transparent to be seen through. 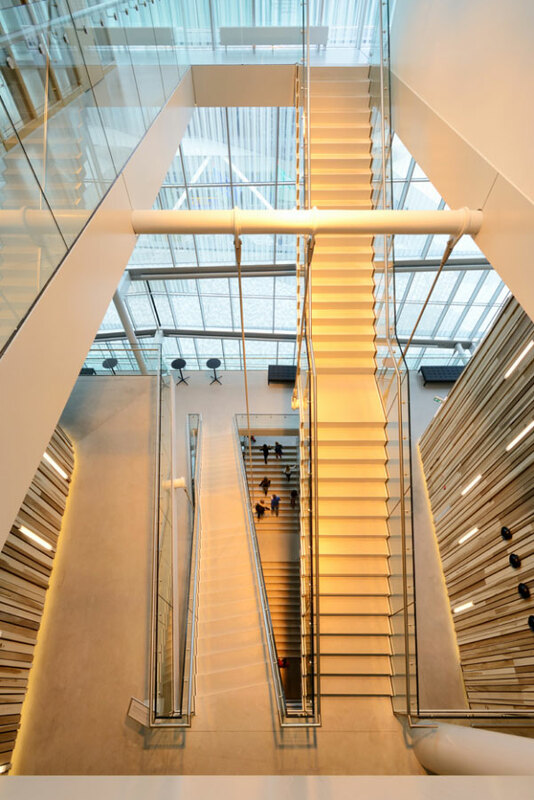 A ‘shop window,’ roughly 20 metres high, enables passers-by walking across the central square to get a glimpse of the foyer and audience inside. 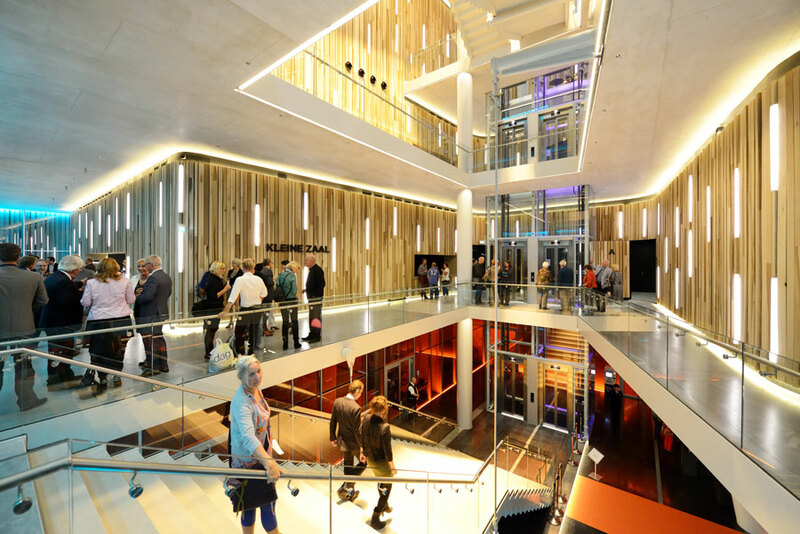 Theatregoers, in turn, overlook the town centre from the three foyers, respectively 5, 10 and 15 metres above ground level. 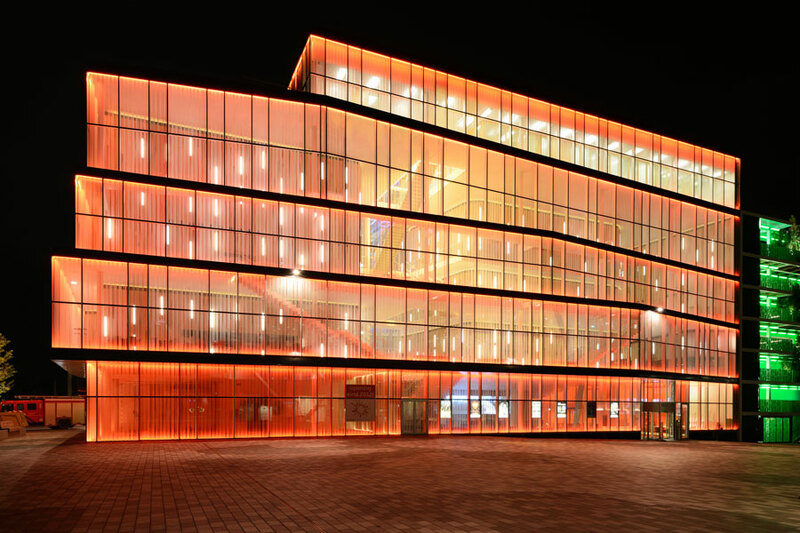 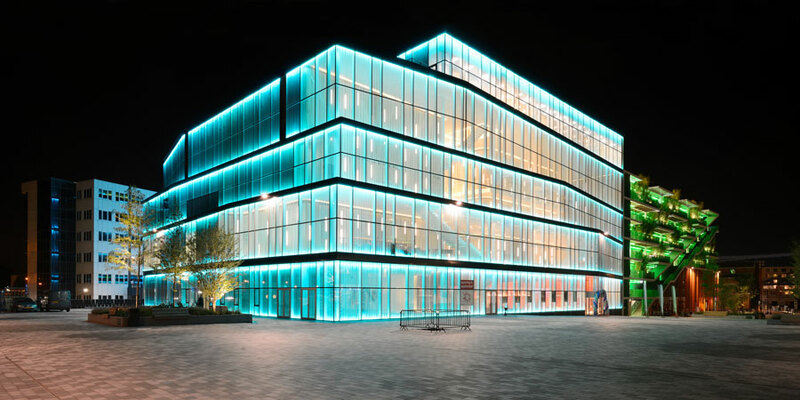 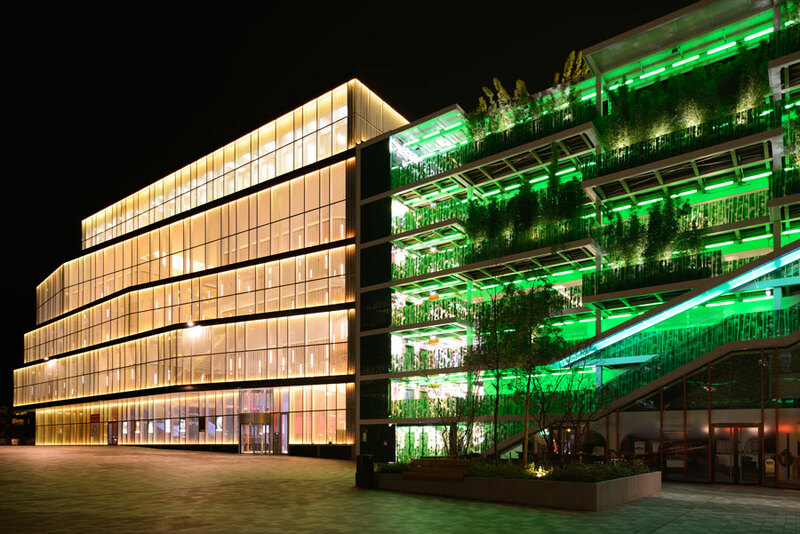 The façade is floodlit after dark with energy-saving LED lighting. 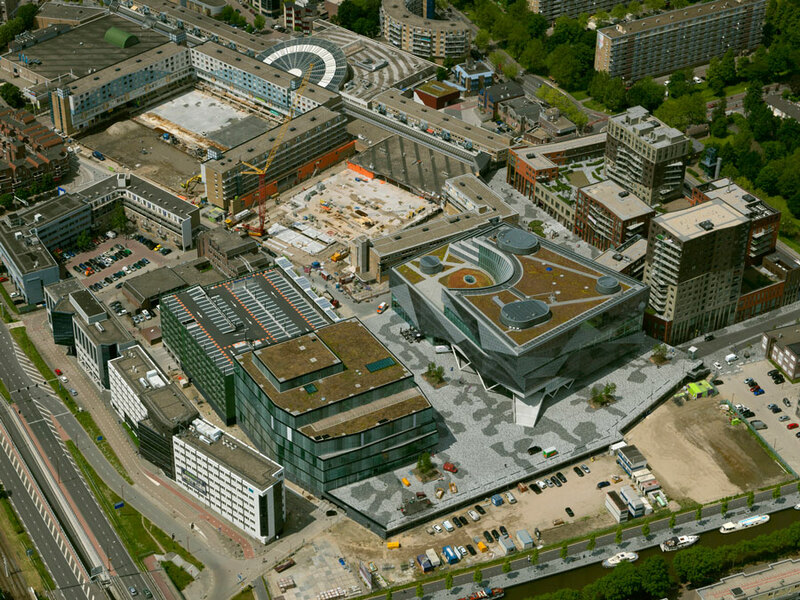 In the redeveloped town centre nearly all the cars will be parked underground with the exception of the multi-storey car park next to the Kunstcluster. 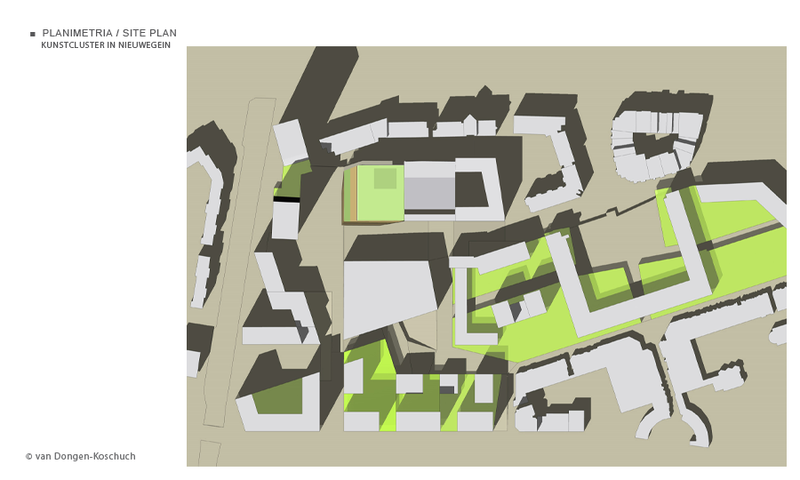 This block is literally a green lung in the stone-built urban environment. 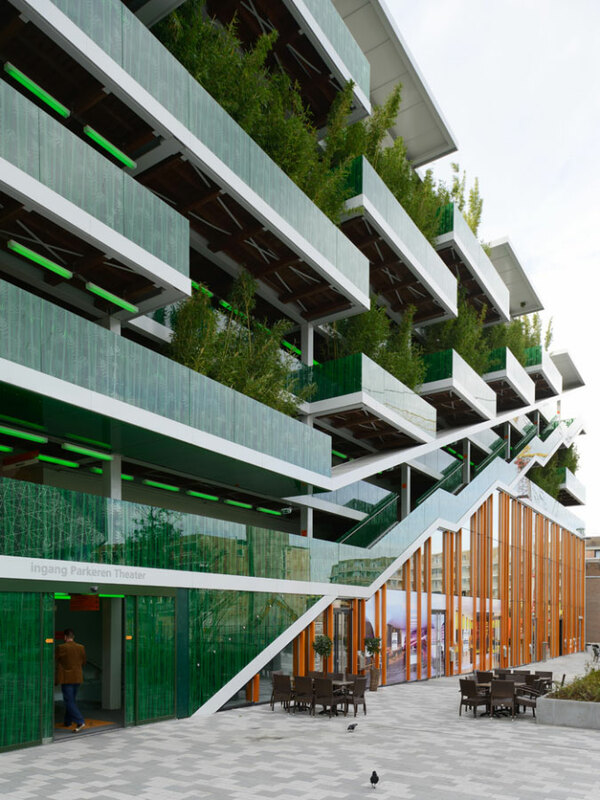 The design intent was to make the parking structure carbon-neutral both to build as well to operate. 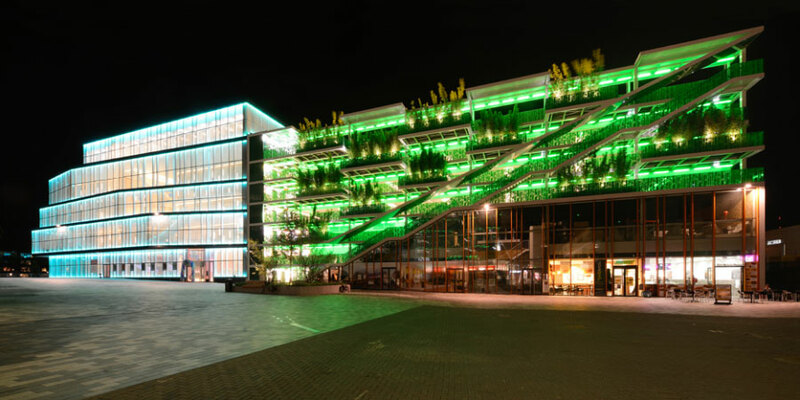 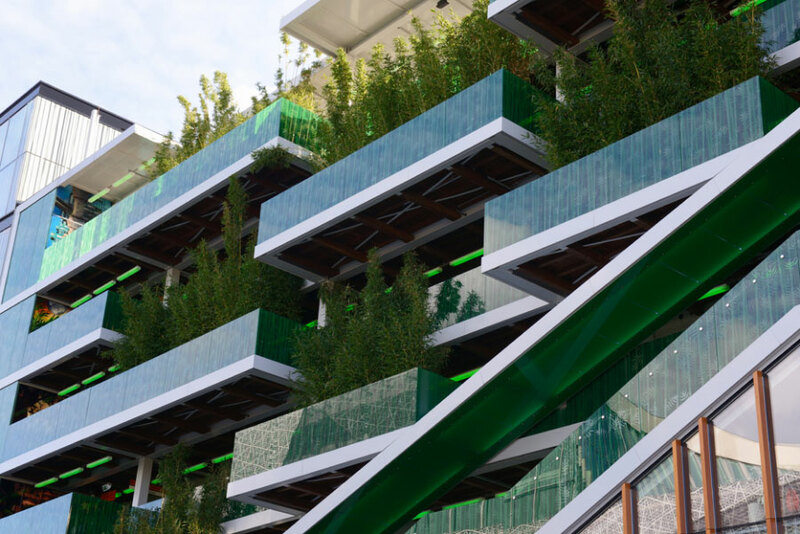 The garage facade on the Stadsplein side is four metres thick and contains a cascade stairway that wends its way up and down through a bamboo plantation six metres high. 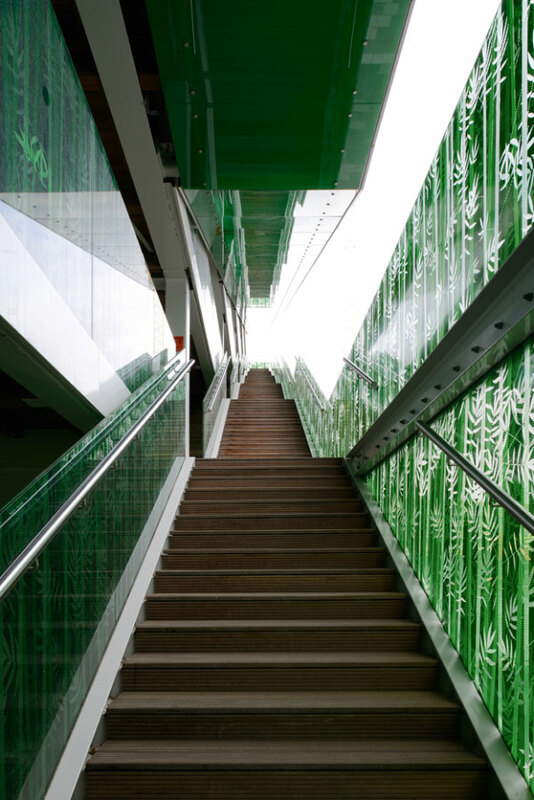 Prints on the balustrades and other glazed surfaces graphically reflect the bamboo image. 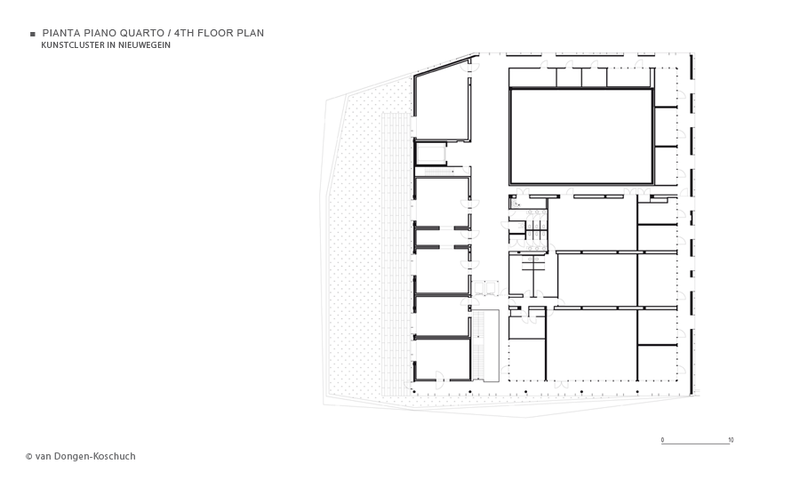 The ground floor accommodates a retail outlet to create a vibrant city streetscape.